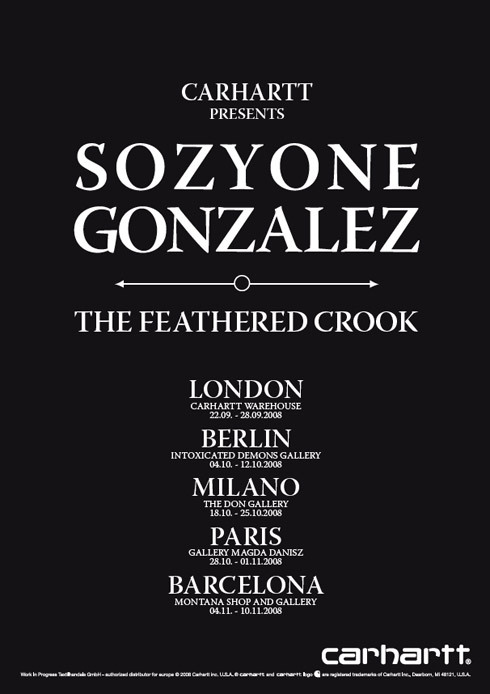 Main focus of the exhibition is the first advertisement campaign of Sozy One for Carhartt Spring/Summer 2008 “The Feathered Crook”. The 6 canvases will be exhibited next to his drawings and paintings showing the development of the idea and realization of “The Feathered Crook”, as well as the genesis of the Carhartt Fall/Winter 2008 campaign “The Triumphs”. Sozyone aka Sozyone Gonzalez aka Sozyone Million or just Pablo Gonzalez is a painter, sculptor, photographer, graffiti artist and musician. Born in Brussels and influenced by his neighborhood, his artwork works around the world of villains, forgers, gangsters and crooks. For him they are the last heroes of modern society, the last survivors who stay with the old school ideals. Also the two advertising campaigns for Carhartt work around this world. Exclusively available only at the galleries during the exhibition, are limited screenprints by Sozyone Gonzalez, as well as, patches and a book and DVD about his work.